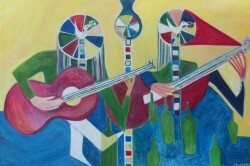 Artist David Swartz discusses his painting ‘Birds On Ladders Playing Guitar’ at Galleria 814. This particular painting, according to David, is about music, inspiration, inter-connectivity and elevation. While the ladders represent elevation, the birds playing the guitar symbolize how music can inspire and join us together. Prominent features of this painting are the player’s hands in conjunction with colorful wheels or circles, representing movement, memory, motion and sound. In his ‘Birds on Ladders’ paintings David has created a new language wherein our dreams of taking flight are made possible through the integration of hands, eyes, and a revolving wheel. The paintings envision an alternate landscape of reality – wherein the processes of conception, artistic creation, and perceptual elevation, are viewed as reflections of a transcendental mirror. The wheels symbolize conception, birth, memory, motion, remembrance, perception, energy and the cycles of life. The birds, lacking wings, elevate themselves by ascending ladders and spinning their wheels with their hands. David calls this act of spinning the wheels with one’s hands, “handing the and”, which is another way of saying making or creating music or art, and which has to do with recognizing the infinite creative potential in our hands, when united with our inner eye. Toronto artist David Swartz received his first education in art from his late father Marvin Swartz, an exceptionally gifted painter, print-maker, and art teacher. In the 1990’s David traveled widely in India, Europe, the Middle East and North America, and attended Concordia University and the University of Toronto for Liberal Arts, Philosophy, and Comparative Literature. He graduated in 2002 with a Masters Degree from the University of Toronto, remaining a PhD Candidate between 2002-2006. During this period he developed a substantial body of artwork, including drawings, paintings, sculptures, poems, and theoretical writings about art, poetry, philosophy, language and the artistic process. David had his first curated exhibition in 2008 at the Index G Gallery in Toronto, where he exhibited 7 paintings in an exhibit that included original work by Andy Warhol and Philip Pearlstein. David brought his talents and ideas to the stage in 2010 with Transcendental Mirror: The Ultimate Variety Show and Vision and Sound: Action Painting Underground (a 12-hour live painting exhibition, accompanied by jazz music) featured during Nuit Blanche 2011 at 401 Richmond. In 2013, David will have his artwork mounted at Mount Sinai Hospital.